BLACK GUNN stars ex-NFL player Jim Brown as Gunn, a no nonsense nightclub owner. When his brother brings something to put in the nighclubs safe that could bring a crime syndicate down, he also brings heat down on not only himself but Gunn. When the syndicate find Gunn's brother and kills him, Gunn takes it upon himself to seek vengeance at any cost. 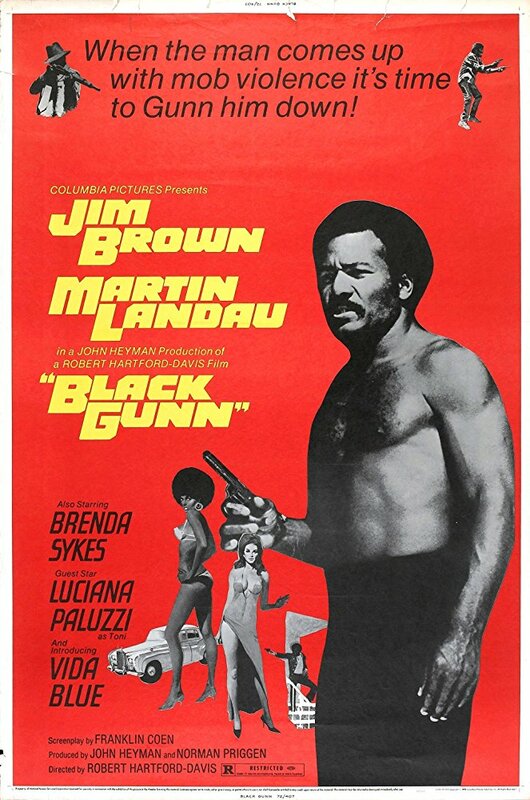 Outside some of the most talked about blaxploitation movies such as COFFY or SHAFT, BLACK GUNN stands out as one of the better movies of the early 1970's exploitation sub-genre. The film stars many recognisable faces including Martin Landau (THE BEING) as Capelli, a man who will become Gunn's worse enemy. The stunning Luciana Paluzzi (THE GREEN SLIME) makes an appearance as Toni another member of the syndicate, and Bruce (father of Crispin) Glover (Mr. Wint, DIAMONDS ARE FOREVER) playing mobster Ray Kriley. Everything you would expect to find in a blaxploitation movie is here, funky music, witty remarks, car chases, killer shootouts and some crazy fight scenes. Besides all of that, the film also features a story that sees Jim Brown show an emotional side to his tough guy character, which keeps you wanting his character to get justice for his brother. If you have never seen a blaxploitation movie you couldn't go wrong with seeing BLACK GUNN as your first foray into the subgenre.